Hours of backyard fun describes what the New Kettler Air Tire Swift Tricycle will bring to your home! 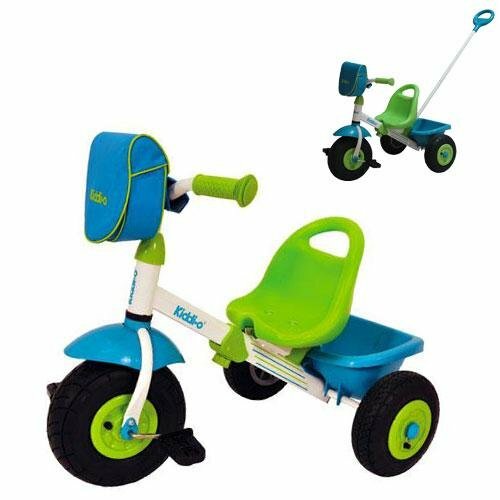 This Tricycle comes fully loaded with a four position adjustable ergonomic high back seat with hand hold, pneumatic tubeless air tires, quick adjust – removable parent-handle so you can take control when need be, a low center of gravity which prevents tipping over. Also included is the handlebar bag for storage on the go and rear dump bucket for hours of enjoyment! The Kettler Swift Toy Tricycle is made with a high carbon steel frame and fade resistant powder for years of enjoyment! Recommended ages are 1-5 years.